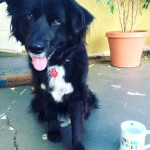 We’ll be posting our favorite pet stories on Wednesdays here on the blog. We hope you enjoy the feature and come back to read more! Our first post is about a pit bull named Blitz from the site “Life with Dogs”. Why do pit bulls have such a negative stigma attached to them? They are strong and muscular, yes, but they are also protective, loving, and affectionate animals similar to non-bully dog breeds. They are known as a “nanny” dog but at the same time are considered by many to be aggressive and threatening. I love this article because it shows a combination of strength and heroism of a pit bull saving a lady from a very scary situation with her abusive husband.